After three beautiful months exploring, researching, loving, learning, experiencing, laughing, and eating saffron ice cream, I'm finally back in Chicago. 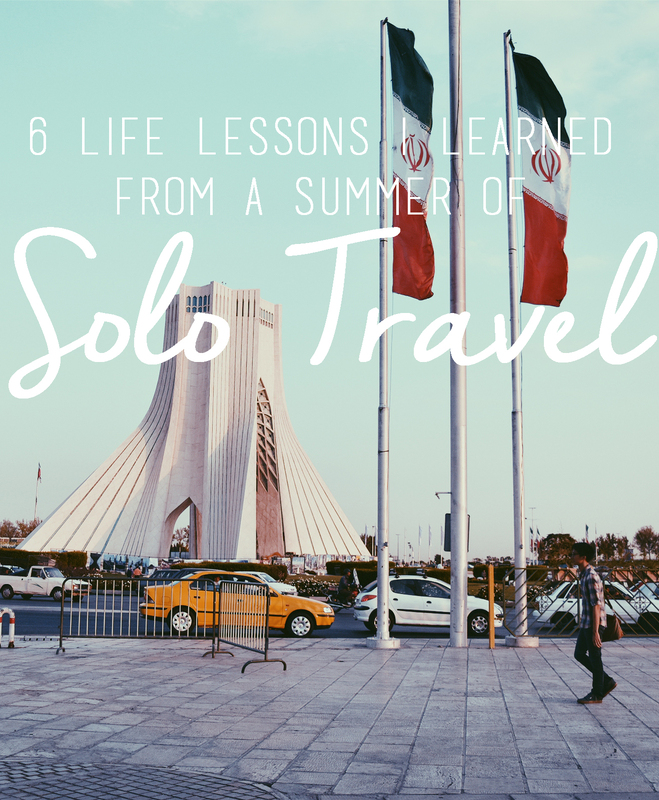 I've always encouraged solo travel (especially for women) because it is such a powerful way to learn, grow, and develop as an independent individual. After some mad reflection in the airports + 17 trillion hours in flights, I put together a quick little list of reminders and lessons that I have learned through my travels and that have made my life so much sweeter. 1. How to let go of Stress | Culturally, Iranians consume poetry and nature to clear their minds and refresh their souls--a practice I wasn't too used to, as the only jungle I lived close to in the USA was made of concrete. But when you're nearing deadlines, struggling with communication, all of the interviews you scheduled for the upcoming week were just cancelled, and your traditional methods of stress release are not working (Netflix doesn't work in Iran due to sanctions), you turn to whatever seems to be working for the people around you. Whereas before I was able to look at, and appreciate, the outdoors, my Iranian friends and family taught me how to internally and wholly consume nature, and the poetry that is saturated with such imagery. While I couldn't fit Iran's outdoors in my suitcase (it was against USA Federal custom laws), I did fill the corners of my suitcase with Persian poetry. A line I recently memorized: "سخت می گیرد جهان بر مردمان سخت کوش " (Hafiz) which roughly translates to something along the lines of the world is difficult for those who take difficulty with everything. Except obviously more poetic and beautifully written. Because common, it's Persian poetry. 2. Live a Little | Without getting into too many details (hi, mom!) sometimes rules are meant to be broken, nights are for staying up (& out), and risks are for taking (...most of the time). Definitely not encouraging making stupid decisions, but a little adrenaline now and then gives life a bit of flavor. 3. Find Reasons to Enjoy any/every Moment | When you've missed the last bus from Berlin back to Hamburg and it's too dangerous to leave the sketchy train station you're trapped in for the night with your cousin (aka just another day in my life), the world seems to get a little darker. (Or maybe it was because the sun had just set). But the all-nighter that we pulled in the train station turned out to be one of my favorite memories from Germany. I learned that life is so much more beautiful when you find reasons to appreciate the little moments that might not always initially appear pleasant. 4. Don't Underestimate Yourself | You are talented and have the ability to get major sh*t done. Don't waste you're time procrastinating or distracted. Set goals and don't sleep until they're actualized. Get out there and do something. Something different and new. I learned how to spend less time indoors. 5. Family is the Best | I have the privilege of having a wonderful, caring, and supportive family, and sometimes it just takes several months of traveling alone to really realize what the most valuable thing is that you have. Photo taken in front of the "Freedom Tower" in Tehran, Iran.